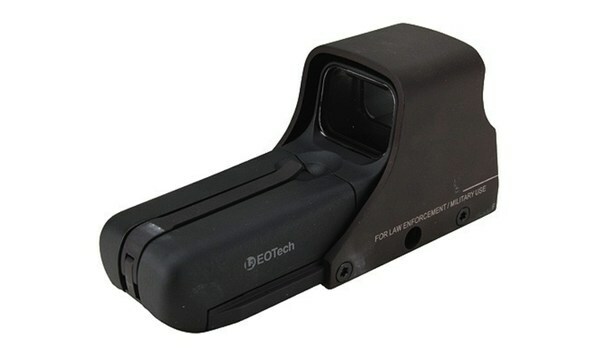 I was interested in picking up an EOTech holographic sight for a flat top AR15 carbine. I was looking for something to use for range use and possible home defense. After researching all of the options I came to the conclusion that I did not necessarily need a sight that was compatible with the latest night vision devices, so I chose the EOTech 512. The sight came packaged in a “bomb proof” case to protect it while shipping and included a lens cloth to keep the glass clean and clear. After reading through the instruction manual, I loaded the two AA batteries and found a spot on the top rail of my AR15. The unlimited eye relief and no worries about parallax allowed me to place it an inch in front of my ARMS M-40 back up iron sight. With the ARMS sight and a fixed front sight post I was able to co-witness my iron sights in the event the EOTech should lose power. The EOTech 512 installed painlessly with the large head of the cross screw allowing me to securely mount it without the use of tools or taking it to a gunsmith. I pressed the two rubber coated buttons in the rear and the sight powered on immediately. A pair of arrows allowed me to adjust the brightness settings and after powering it off. The sight retained this setting in its memory. It was time to take it to the range. The sight required a bare minimum of modification to center the dot. 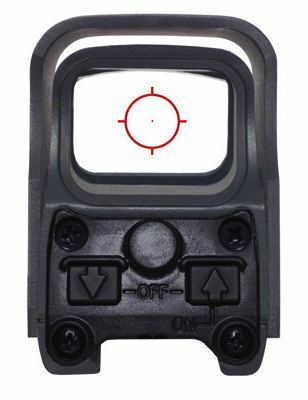 The EOTech 512 utilizes a large 65 MOA Dot with a smaller and slightly brighter 1 MOA dot in the center. Shooting quickly at a range 100 yards, all rounds made it in the center mass portion of the FBI silhouette target. Now it was time for precision. Centering the 1 MOA dot on the head portion of the target, I was able to shoot a 20 round group that resulted in one ragged hole on the target. At 100 yards, the 512 more than met my needs. I had bought a Scopecoat to cover the sight for when it was stored in the safe; however this was not convenient for using at the shooting range unless the shooter is wearing pants with large cargo pockets. A week later I ordered a set of flip up lens covers from another company on the Internet. They work well, but do require disassembly of the sight body from the protective housing. The 512 is lacks a few features that may make it less than ideal for certain applications. It doesn’t come with a flip-to-the-side magnifier and it doesn’t have night vision compatibility. However, if you’re looking for an excellent workhorse sight that won’t break the bank, the EOTech 512 is should definitely be on your short list. Click here to check current pricing and read customer reviews.